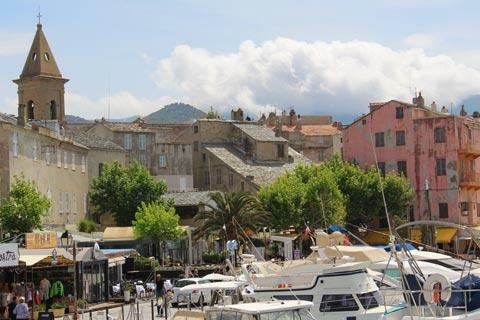 Saint-Florent occupies a lovely position with clear blue seas and a pretty harbour to one side and craggy hills covered in trees and bushes rising up behind. 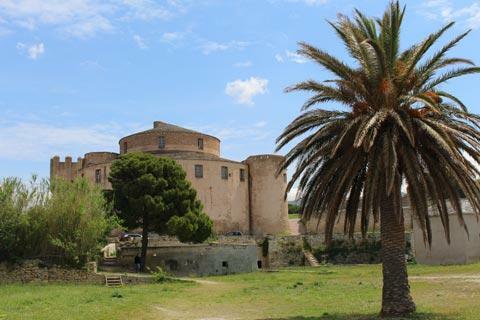 Dominating the village from a headland is a Genoise citadel, built in the 15th century. The town is on the south-western side of the base of the Cap Corse peninsula, in the north of Corsica and 24 kilometres from Bastia. 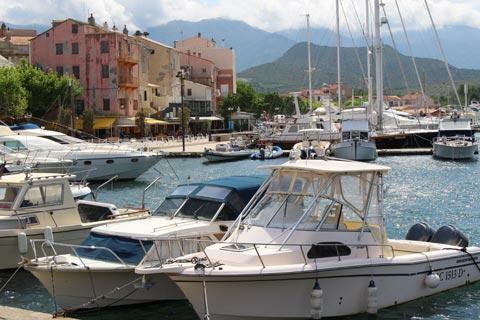 Saint Florent is a popular resort town on Corsica on the gulf of Saint Florent. 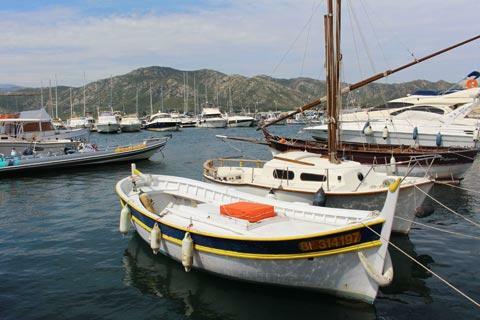 Start your visit with a walk around the harbour to see the fishing boats and luxury yachts. All around the harbour there are bars and restaurants including, not suprisingly, lots of excellent fish and seafood restaurants. 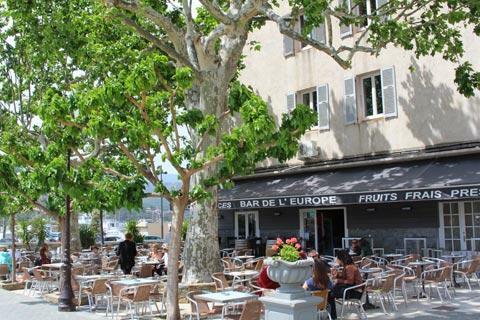 France This Way comment: beautiful by day, the harbour is also lovely at night when the cafes light up the waterfront and out at see the lights of the boats are dotted around the bay. Up above the town the citadel is also illuminated at night. 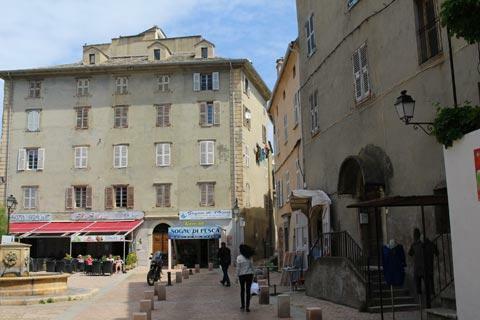 After your promenade around the harbour you can explore the charming streets of the old town in Saint-Florent. 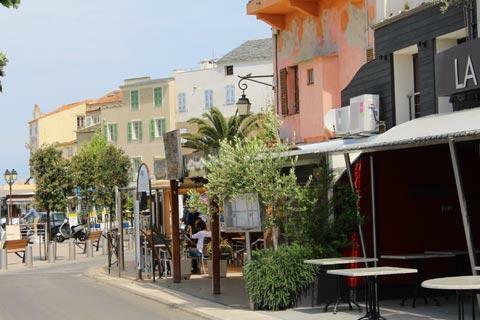 This part of the town, quite small, is based around the Place Doria and the Place des Portes where you can enjoy a drink whilst overlooking the sea below. 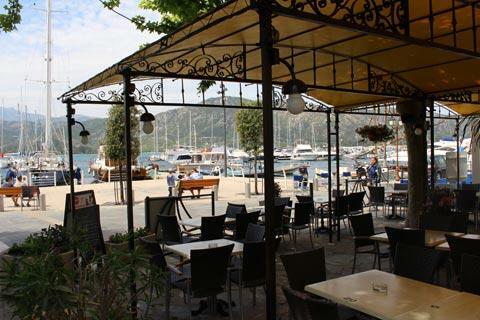 This is where the locals gather to play Petanque and sit drinking strong expresso coffee. You will also find various small shops. 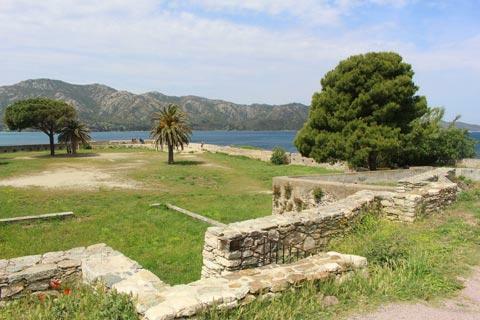 There is a long sandy beach, the Plage de la Roya, along the coast west of the harbour in the centre of Saint-Florent. From here you can continue to the promontory with the citadel. The citadel was built in 1440 and was of great importance in the defence of nearby Bastia and the battle for control of the Mediterranean waters. Admiral Nelson is reputed to have said "Give me the Gulf of Saint Florent and I will prevent any ships leaving Marseille or Toulon". 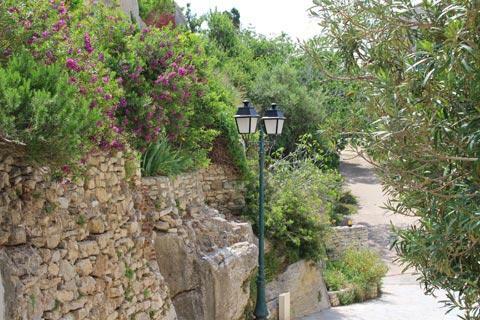 Of Genoise origin, the citadel has also belonged to the Aragonaise, French and Italians at different points in history. 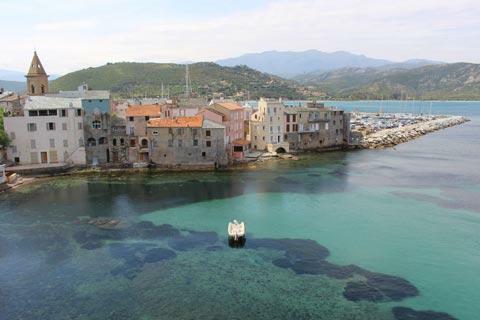 Saint Florent was also of importance in the second world war. It was occupied by fascist Italians but local resistance groups were active in helping the allies. Corsica was the first French department to be liberated and a key battle for liberation took place at Saint Florent between German troops and a company of Moroccans. There is a Muslim cemetery for the dead on the edge of the town. The citadel is an attractive round stone building, although a large part of the other buildings were destroyed in the 17th century, and from here you get fabulous views over the town, the sea and the mountains including the most popular photo of Saint-Florent, with the ancient houses along the seafront. 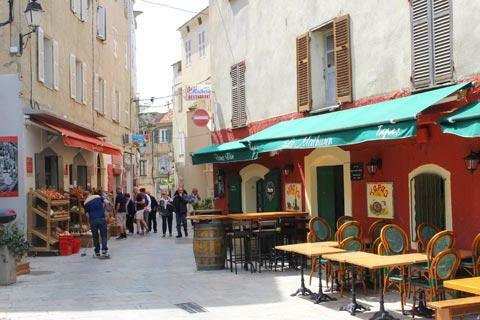 Make sure you sample the local wine when exploring around Saint-Florent. 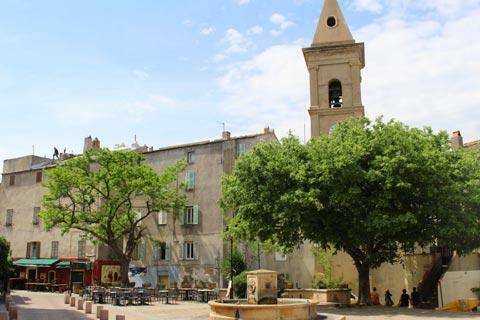 The region is very fertile and produces one of Corsicas best wines in the vineyards around Patrimonio - the village is six kilometres north-east of Saint-Florent and a good place to start exploring (and tasting) the local wine. When you've finished exploring the town head off to see the nearby Cathedral of the Nebbio, a small cathedral in the Pisan-Romanesque style built on the site of the original Roman town that existed close to where Saint Florent now stands and about one kilometre from the centre of Saint-Florent. Heading north-west from the town you can reach the famous beach at Saleccia, a beach of fine white sand said to be among the lovelieste to be found anywhere on the Mediterranean. The beach is half a mile long and backed by tree covered hills. 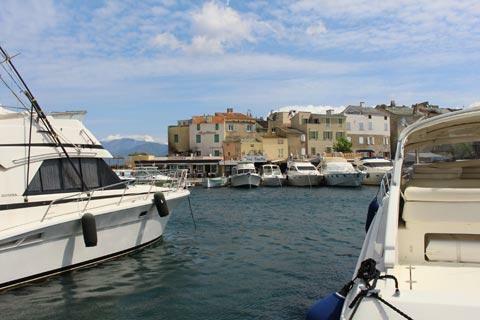 Unfortunately access is difficult and visitors usually arrive by boat that can be organised in Saint-Florent. 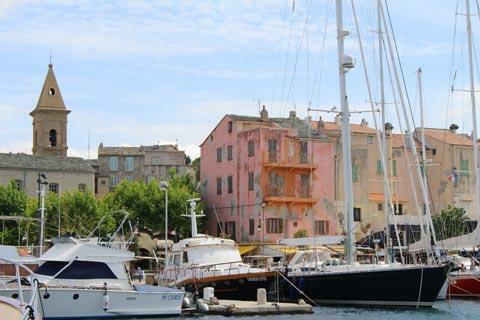 the main alternative is a long walk (about six hours from Saint-Florent each way!) or by four-wheeled drive vehicle. Kylie Minogue has been seen holidaying here in recent times. 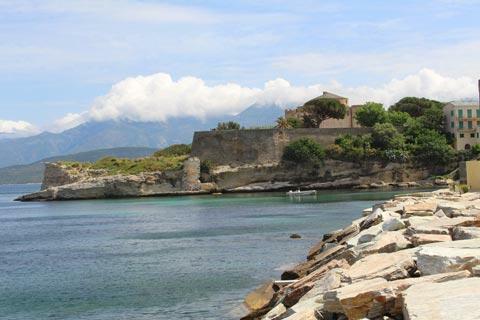 You will also want to explore the harbour and citadel at Bastia, make a tour of Cap Corse, and explore the landscapes of the Nebbio and Desert des Agriates while you are in this region.